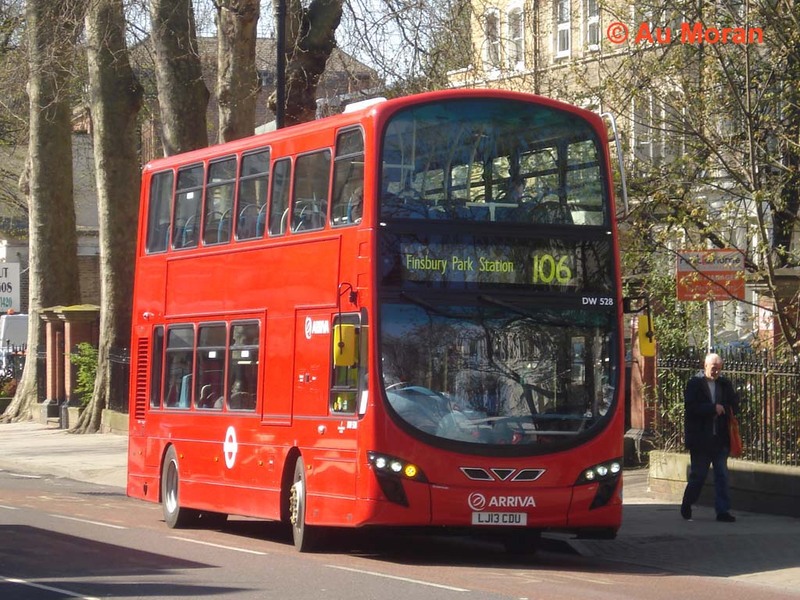 Route 106 has passed from Stagecoach London to Arriva London operation, based at Ash Grove garage. New DB300/Gemini 2 buses are in place, these being Arriva's preferred model at present. Several people have sent contributions to cover the change, so here is a selection. The first view is of DW528 (LJ13 CDU) near Stoke Newington Station on 28 April 2013, the second day of Arriva operation. A second view is provided by DW520 (LJ13 CME) laying over at Finsbury Park on 6 May. Finsbury Park has two bus stations, one each side of the railway, which cuts the bus network in two due to a low bridge, and this is the southern one. Finally, DW527 (LJ13 CDO) at Clapton Pond on 29 April. The contract renewal was accompanied by a slight reduction in frequency, but the first and third pictures taken mid-route suggest that patronage is pretty light, at least outside peak times! Harry Blundred is a name that is quite well known in bus circles, and he is known for his pioneering work using minibuses. One of his schemes used Ford Transits in Exeter, and he repeated the idea in several other towns across the country. Another well-known scheme was Oxford Transit, using minibuses in competition with the established operator, City of Oxford Motor Services (now The Oxford Bus Company). In the early 1990s he set up one such scheme in East London, using Exeter-registered Ford Transits with Mellor bodywork painted in a blue livery, and thus was born Docklands Transit. The scheme ran in competition with London Transport's own network, and LT did not recognise it and therefore gave it no publicity while LT tickets were not accepted on Docklands buses. This was no doubt why the scheme did not last long, even though some useful facilities were introduced and routes generally ran at high frequencies. But this was not to be the end of Docklands Transit, because a few years later three minibus routes in East London were won, the 287, 366 and 368. Although none served the Docklands (apart from one to the very periphery at Beckton), the Docklands Transit name was re-ignited, although (as before) Docklands Minibus fleetnames were applied. Red liveried Mercedes/Carlyle "midibuses" (as LT liked to call them) were used. The original minibus concept had been largely to enable better penetration of housing estates and other routes with narrow roads, but a growing trend was to convert busy trunk routes to midibus operation at a higher frequency. The single deck conversions were usually accompanied by a frequency increase, the rationale presumably being to increase patronage; what the planners didn’t seem to realise is that if you increase patronage, you need to increase capacity to cope with it – whereas most such schemes drastically reduced total capacity! One such route coming up for retender for a start in early 1996 was the 106, and this contract was awarded to Docklands Transit using 9.8m Darts. In this case the Docklands Transit fleetname was applied to the vehicles, as "Minibus" would not quite sound right on a bus that was just as long as a double decker! The original Darts bought were single doored, but a plan was hatched to replace them by similar dual doored versions, with the single door Darts to be transferred to the 366 and 368 where demand had outstripped the capacity of the Mercedes. However, before the new buses were delivered, it was announced that Harry Blundred was to pull out of his remaining British bus operations, having already sold off some parts, and Stagecoach bought the rest, including the Docklands operation. This was perhaps a surprising development, as Stagecoach has a very different philosophy, being a big fan of big buses, and outside London you would often see massive 87 seat Olympians carrying the proverbial two old ladies and a dog. In Oxford some routes were converted from 16 seat Transits to Olympians with a capacity of 100! In addition, many standard floor Dennis Darts have been transferred out of London resulting in a culling of many of the minibuses from the acquired operations. Returning to London, the Docklands Minibus fleet was quickly absorbed into Stagecoach East London's fleet. The Poplar base was closed with buses transferred to Barking and (the 106) Stratford garages. The new dual door standard floor Darts were delivered directly to Stagecoach East London a few weeks later, with the minibuses duly being seen off. These became virtually the last high floor single deck buses delivered to anyone anywhere in the country, the low floor version of the Dart having become standard issue. 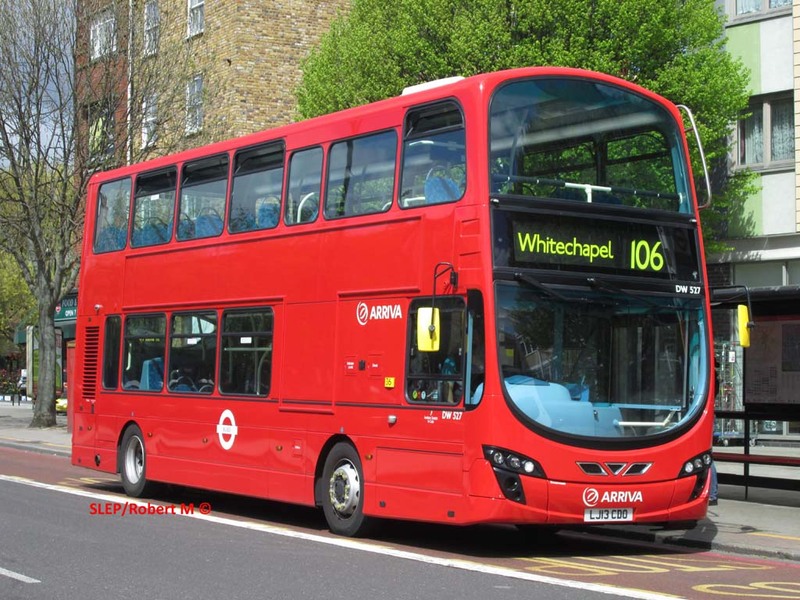 The 106 was the only trunk route ever operated by Stagecoach London on the "high frequency single deck" principle, and at that only by accident. This may well be a reflection of the Stagecoach philosophy for big buses, even though it was London Transport which set the minimal service levels and vehicle specification. It is certainly interesting that in 2001 the 106 was re-awarded to Stagecoach on the basis of double deckers, especially when the D6, the former southern leg of the 106, had just gone from double deck to single deck with First Capital! 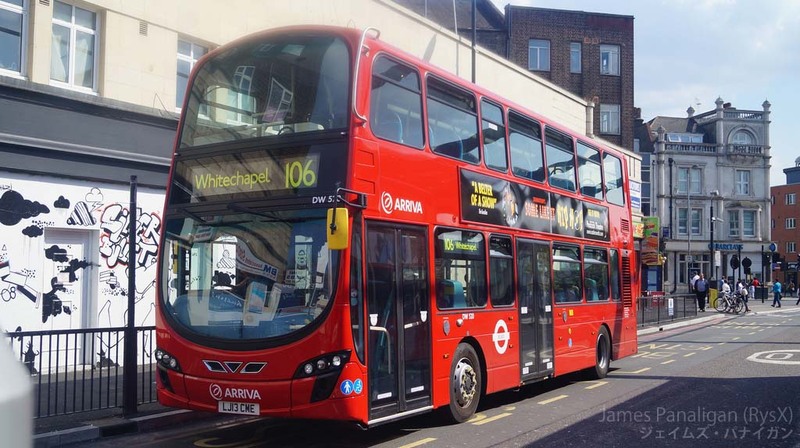 Initially, short wheelbase Tridents were used, but contract renewal from April 2008 called for new double deckers, and newly independent East London opted for Scania OmniCitys. There was some consternation when it was made known that these would not arrive until the following November, but they duly did so. The 106 was the second East London route converted to the type, following route 248. The single deck frequency was maintained at first, but as noted above there has now been a minor reduction; the route is still more frequent than before the single deck conversion.